The AGU Fall Meeting 2017 is coming up at a fast pace and we are excited to present some of our scientific work we have been busy with during the last year. We are also exited and proud to be chairing a session on the High Mountain Hydrosphere with posters Wednesday afternoon (session) and an interesting oral session on Thursday morning (session). The session features talks from all over the globe aimed at improving our understanding of high mountain hydrology using a wide range of techniques. We have something to present to you on every single day of the week! In the morning Pleun will show results from her WRF modelling of high-altitude precipitation (abstract), looking at the impact of different resolutions on model outcomes. In the afternoon Emmy will present her estimation of the fraction of high-altitude solid precipitation that returns back to the atmosphere through sublimation (abstract). Clouds forming over Ganja-La in Langtang Valley. Gamma ray sensor near Yala glacier used to measure snow water equivalent and derive sublimation. 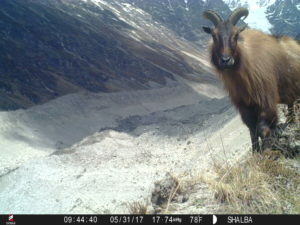 Captured by one of our time-lapse cameras. In the morning Jakob will present his poster on the recent Khurdopin Glacier surge, which we documented using Planet satellite imagery (abstract). To learn more about this study, have a look at our brief communication in The Cryosphere. Walter will give a presentation early morning about the drivers of the future water gap in the Ganges-Indus-Brahmaputra basins (abstract). Maxime will present his recent findings on the differences in turbulent fluxes over debris-covered and debris-free glaciers (abstract) during our poster session in the afternoon. In the same session, Pascal will present his efforts in modelling supraglacial ice cliffs on debris-covered glaciers and estimating their contribution to the glacier mass balance (abstract). 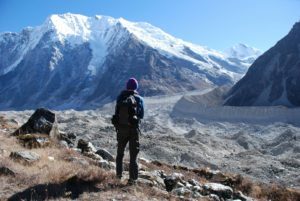 Max admiring the beauty of Langtang Glacier. As part of our own session, Remco will present his findings on the influences of cropland irrigation on high-altitude precipitation (abstract). Later in the morning Philip will present his recent paper on the consequences of climate warming on the glaciers in High Mountain Asia (abstract). Evan will talk about seasonal deformation of Khumbu Glacier as measured from remote sensing and field observations in the morning (abstract). Jakob will talk about turbulent fluxes on a debris-covered glacier just after lunch (abstract). Jakob will also present some recent investigations into the terrestrial ice margin in Greenland in the afternoon (abstract). 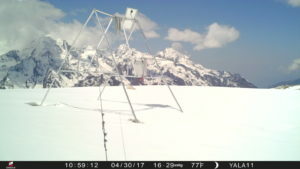 On Friday afternoon, Joseph and Philip will present their work on the multi-temporal UAV monitoring of a mountain snow pack in the Canadian Rockies using optical and thermal sensors (abstract). A curious visitor at our time-lapse camera monitoring the debris-covered Shalbachum Glacier. Joseph pounding in markers for the UAV surveys on Fortress Ridge. Follow us on a trip into the world of mountain hydrology and visit one of our talks or posters! In our new study published in Nature last week, we show that even if the planet only warms up by 1.5 degrees Celsius 36% of all Asian glacier ice will have melted by the end of the century. More extreme temperature scenarios, for example the ones projected by IPCC’s RCP8.5, will result in mass losses of up to 64%. Glaciers in the high mountains of Asia play a substantial role in regional water resource and they have been losing mass over the last decades (e.g. Brun et al, 2017), a trend that is most likely to persist under future temperature rise. At the 2015 UN Climate Change Conference in Paris, 195 nations signed the “Paris Agreement” and agreed on efforts to limit the global temperature rise to 1.5 °C. It was unknown, however, how much of Asia’s ice mass would be lost under such a scenario, or under more extreme temperature scenarios. 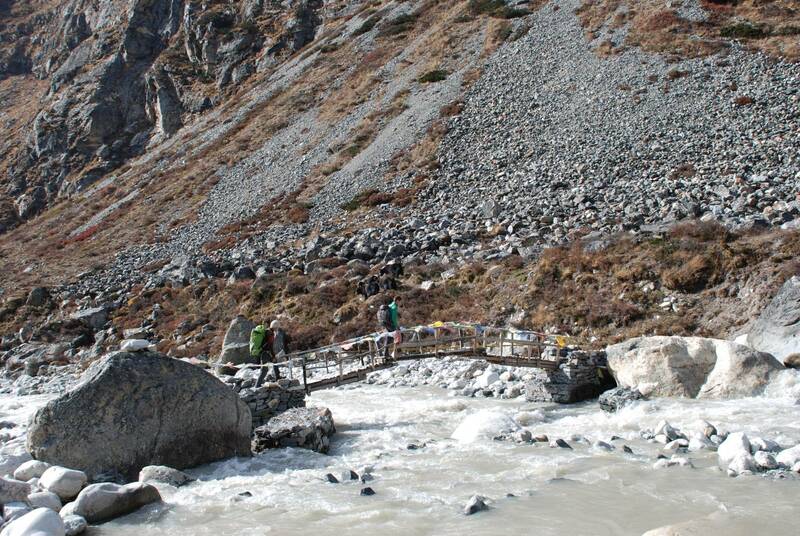 To determine this, we have developed a glacier model for all individual Asian glaciers larger than 0.4 km2. We have forced the glacier model transiently up to 2100 by the full CMIP5 ensemble of 110 climate models, and have taken into account present-day climate, the imbalance of the glaciers, and the effect of debris cover. Our results show that only a handful of the climate models project a global temperature rise of 1.5 °C and that the glaciers in the region warm consistently more than the global mean because of elevation dependent warming. By the end of the current century the 1.5 °C scenario results in a loss of over one third of the present-day ice mass in the region, while mass losses projected under more extreme temperature projections go up to almost two third. 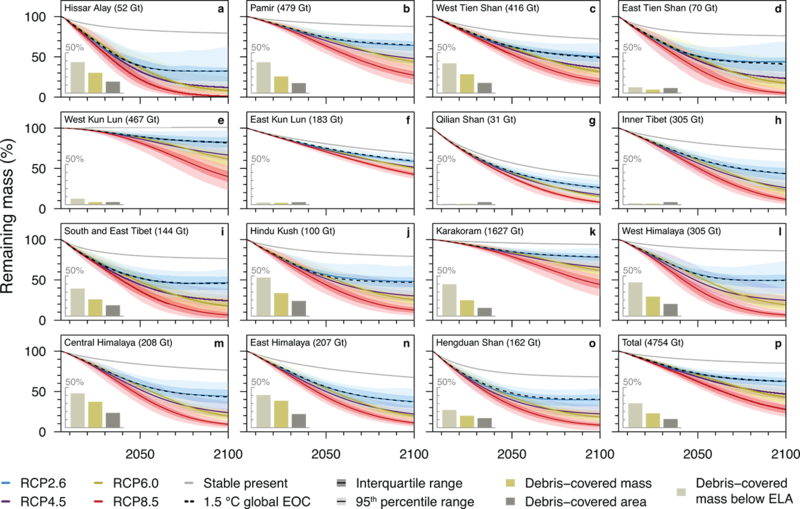 We have also found that there are large regional differences in projected mass loss, which are caused primarily by regional differences in debris cover, ice mass, present-day glacier imbalance, and glacier sensitivity to climate perturbations. Mass loss projections for the current century aggregated by sub-region of the Randolph Glacier Inventory v5.0. The bar charts indicate the regional prevalence of debris-covered glaciers. To learn more about our study refer to the paper below, or have a look at our visual story line. 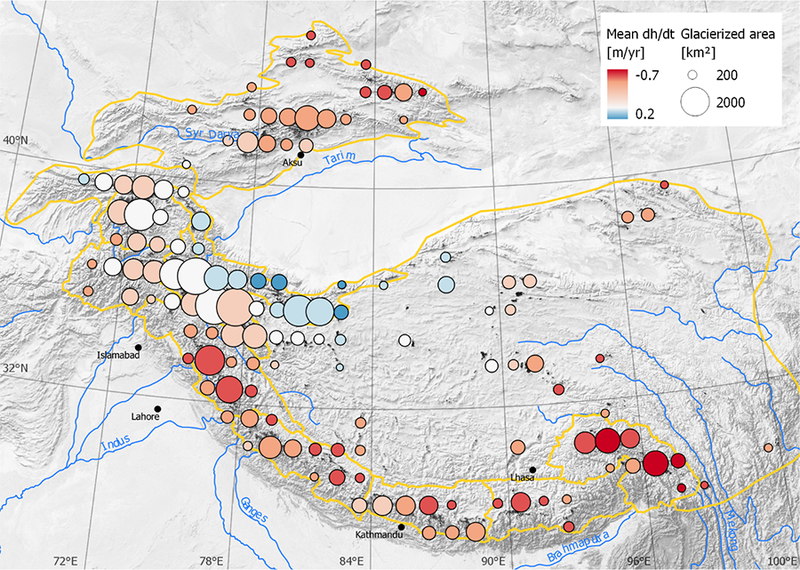 Fanny, Patrick, Etienne Berthier and colleagues from Oslo University (Andreas Kääb and Désirée Treichler) have just published the study “A spatially resolved estimate of High Mountain Asia glacier mass balances from 2000 to 2016” in Nature Geoscience. They used more than 50,000 ASTER satellite images to derive digital elevation models and to track glacier thickness changes over High Mountain Asia. They provide the first consistent estimate of volume change for ~90 000 km2 of glaciers. Their study confirms the existence of the so called “Karakoram anomaly” and, following a 2015 study by Andreas Kääb et al. refines its location: glaciers located in the West Kunlun, Karakoram and Eastern Pamir have balanced or slightly positive mass changes. 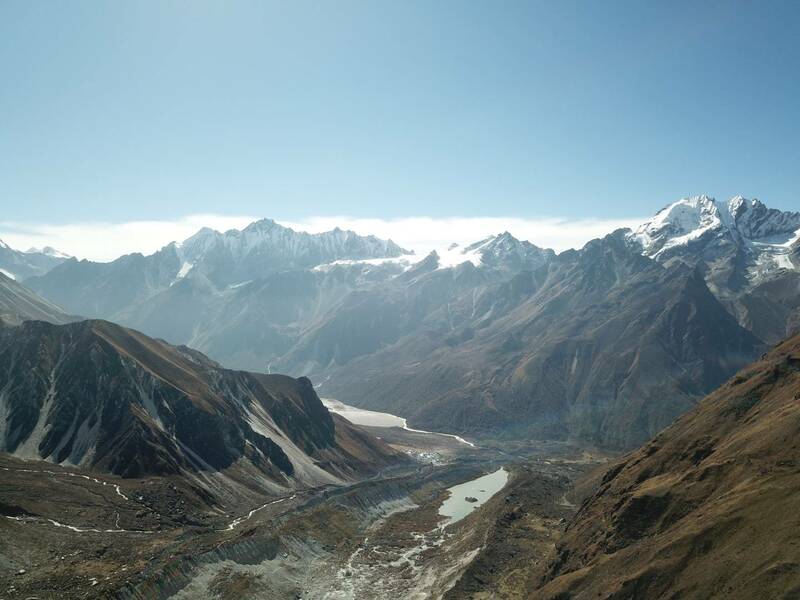 The most negative mass changes are found in the Eastern Himalaya, where glaciers loose mass at rates similar to the ones in the European Alps (up to 0.62 ± 0.23 m w.e. yr-1). Rate of glacier elevation change (in m/yr) for the period 2000-2016. Red dots represent area where glaciers are thinning and blue dots area where glaciers are thickening. These data will help to constrain glacio-hydrological models and to better understand the contribution of glaciers to stream flow and sea level rise. Nevertheless, they provide only mass balance values averaged over 16 years and therefore do not give access to the processes responsible for these changes. More field data are needed to investigate these. We are pleased to announce that on Friday June 2nd Walter Immerzeel received the Boussinesq Prize 2017, a tri-annual award given to a person for recognition of his/her outstanding scientific contributions to hydrological sciences. It was awarded by prof. Bob Su at the Boussinesq Spring Meeting 2017 in Enschede. At the meeting Walter gave a keynote presentation on “Recent advances in understanding climate, glacier and river dynamics in high mountain Asia”. A video of this presentation can be watched here. 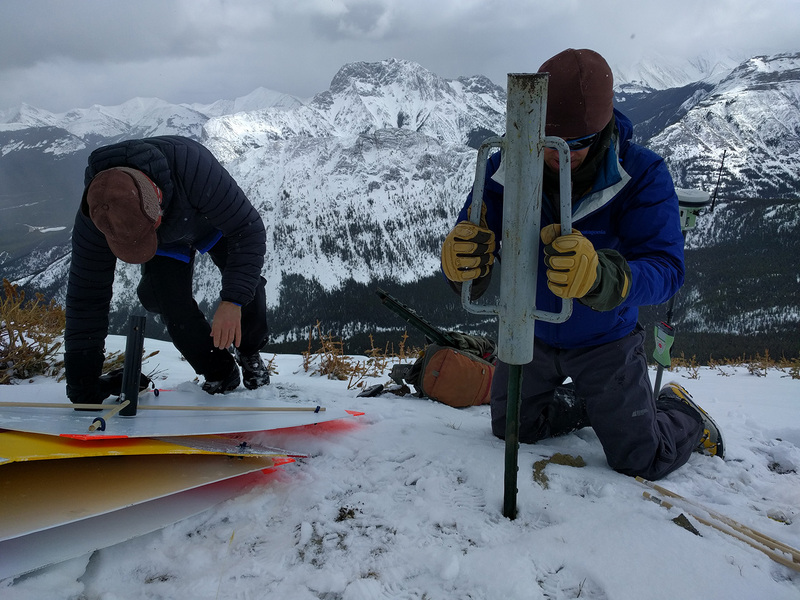 I am visiting Canmore in the Canadian Rocky Mountains to collaborate with Joe Shea on a new unmanned aerial vehicle study led by the Centre for Hydrology of the University of Saskatchewan. The objective is to monitor snow melt and redistribution throughout the melt season using UAV surveys and in situ measurements of the snow pack. 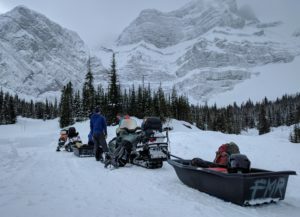 The study site is near Fortress Mountain at about 2300 m elevation and is easily accessible by a combination of car and snowmobile. Therefore, we went off to a new site just a bit further up the ridge today. Of course only after checking the weather and wind conditions using the various self-maintained weather stations at the site. Objective: redo the entire ground control survey that was carried out at the other site and perform some UAV flights. Getting up the ridge with snowmobiles and toboggans. Pannable 360-panorama of the site on Fortress Ridge and the DGPS setup. Onset of the winds while doing the final DGPS setup. 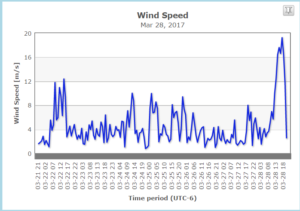 Graph of wind speed measured at Fortress Mountain over the last week.